2. Sow welfare in the farrowing crate and alternatives. 3. Piglet mortality and morbidity: inevitable or unacceptable? 6. Chains as proper enrichment for intensively-farmed pigs? 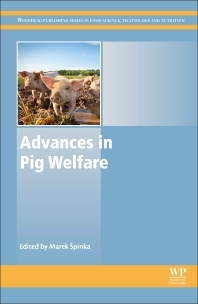 With its expert editor and international team of contributors, Advances in Pig Welfare is a key reference tool for welfare research scientists and students, veterinarians involved in welfare assessment, and indeed anyone with a professional interest in the welfare of pig. Marek Špinka is based in Prague, Czech Republic, where he leads a research group at the Institute of Animal Science and is Lecturer in Comparative Psychology at Charles University. His research focuses on the social behavior and welfare of pigs and cattle as well as on basic questions within the fields of animal social life, communication and ontogenetic development.